When I started playing with rocket stoves the main resource available was the Rocket Stove book. Though I still consider it a must read for anyone heading into Rocket Stove territory, I do not consider it sufficient. It left me with many questions, it has some outdated information and some things that, knowing what I know now, are borderline wrong. Fortunately there is now an additional resource that complements it wonderfully. Earlier this year we participated in two kickstarter documentation projects on Rocket Stoves. I’ll speak shortly about one and at more length about the other. The shortly: the Paul Wheaton 4 DVD pack is a nice to have thing. It was a huge success on kickstarter which made its production value all the more disappointing. It includes 4 DVD’s none of which felt complete and comprehensive (the Fire Science came close). It has low quality video and audio. It was nice to have a glimpse into a workshop with Erica and Ernie which I do not have access to … but it was an opportunistic production. With the funds it raised I felt there was an opportunity to create something much better … an opportunity that was missed. This kickstarter project felt incomplete and … well … icky. Which brings me to the second production How to Build Rocket Mass Heaters with Ernie and Erica by Calen Kennett of Village Video. This was the first of the Kickstarter projects to launch and though it got fully funded it did not create the buzz that the second project got. It was delivered late (I just received mine a couple of days ago) but that was because loads of caring production work went into it. 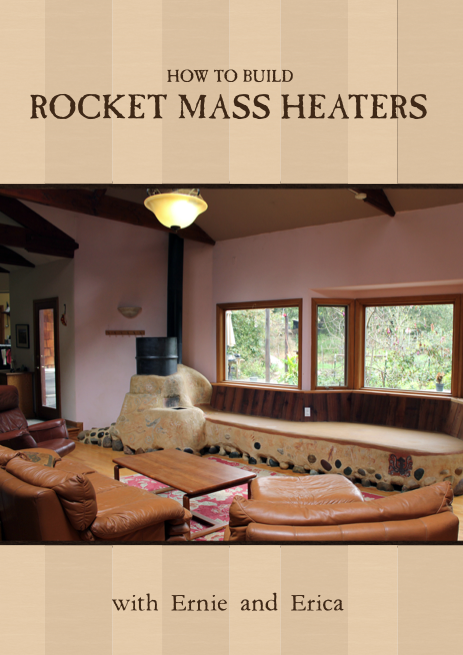 It documents an entire build of one Rocket Mass Heater (the one you see on the cover) – an 8 inch system built over an existing wooden floor. 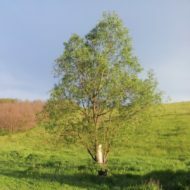 It covers very many details which appeared as questions during my two builds and I have not seen addressed anywhere else, covering tools, materials, design, build and finishing. It has excellent quality video and audio. It is a composite of footage shot on site during the build together with a separetely shot and well thought out interview with Erica and Ernie (with excellent quality audio). Inside the DVD case there is a printed page with a list of tools and materials used in the build … superb attention to detail. The kickstarter edition included Erica and Ernie’s recently published The Art of Fire (which I have yet to take in). In addition there was a surprise on the Kickstarter DVD – the detailed plans for the RMH in the DVD (which more than makes up for one thing that I believe is not emphasized enough in the DVD – an explanation of the basic structure of feed tube, burn channel and heat riser and their dimensions). It is a production infused with care and quality. If you want to get started with Rocket Mass Heaters I would recomment the (above mentioned) book and this DVD.